This is my entry for the Blogger's Challenge #84. 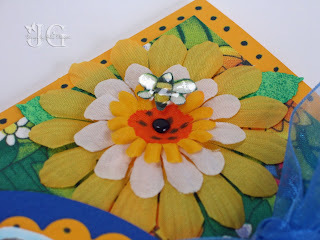 The challenge is to create a birthday card or project. I created this box for possible projects for an upcoming stamp camp. However, I thought it was also a good entry for this challenge. Here it is. 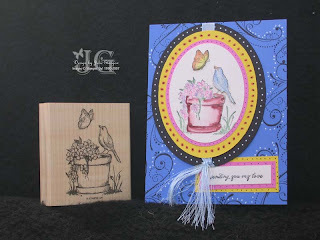 I found the instructions for this box on Split Coast Stampers under Technique Lovers Challenge #203. They can be found here. I will give you one hint. 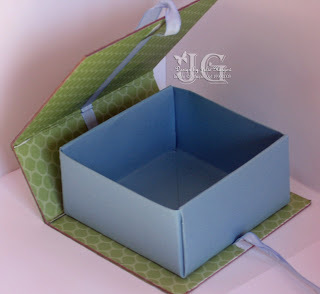 On this project, I used cardstock for the inside box, but it is hard to get the folds perfect. It works better with paper or light cardstock instead of heavy cardstock. I made this card for Techno Stamper's Monday Lunch Challenge. 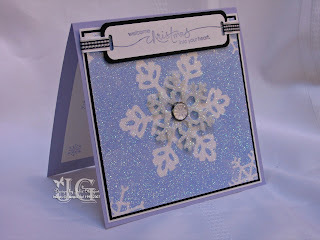 The stamp used on this is from Stamp Your Heart Out, a stamp store in Claremont, CA. I bought this stamp when I first started stamping 11 years ago, and really had not used it until now. I love these kids. I look forward to visiting this store next time I am in California. The colors are Basic Black, Real Red, Brocade Blue, some DSP from my stash, and Shimmery White (hard to see the shimmer in the picture). I added a little Blingz to the snow under the sled to add the glimmery snow look. I also added some felt snowflakes adhered with black brads. You will notice this is a holiday card. I am still on my path to make 5-10 Christmas cards each month. So check back as I expect to have more Friday and Saturday. 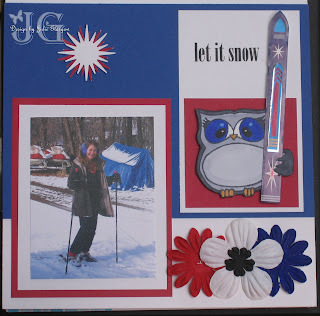 This weekend, I got the scrapbooking bug again. So, I thought I would share the layouts I made. This first layout is from my DD's 6th birthday. Keep in mind, she is 11 now, so you can see how far behind I am. For this birthday, she received a violin from her great-grandpa. I wanted to go with the more formal musical theme, so I chose black and white (to match the dress on the girl), and then added some pink to draw out the color of my DD's outfit. I had some shimmery Bazzill paper and some shimmery stickers which added a little bling to the page (easier to see in person). 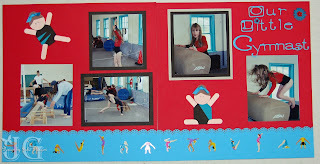 The second page focuses on pictures from the same time period. My DD took gymnastics for a VERY short time. It was just not her thing. One thing about our family is we are all tall (I am almost 5'11"), so we are just not cut out for gymnastics. 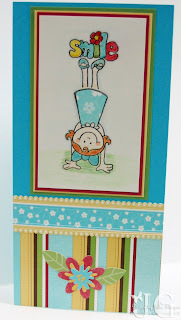 I CASE'd the idea for the gymnasts from "kkreate" on Split Coast Stampers. Here is her sample. I loved the idea and needed something extra for this page. I love the little "punch girls." To create them, I used a tag punch, a slit punch, the Word Window punch, a 1-1/4" circle punch and a 3/4" circle punch. So simple yet so cute. I hope you are not as behind on your scrapbooking as I am. Oh well, it gives me something to work on. 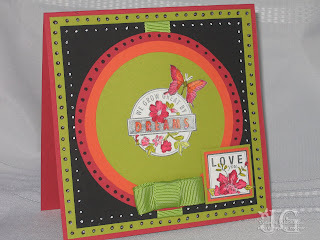 I created this card based on the Split Coast Stampers Dirty Dozen Challenge. Their challenge was to draw on inspiration from their immediate surroundings, creating art that imitates the space they live in as they show us What Makes a House a Home. So, since I live in Durango, Colorado, at the base of the Rocky Mountains, I created this card. The story behind this card is the joy and thankfulness I feel having been so blessed to live in my favorite place in the world. I love the mountains, being surrounded by trees. I tried to portray the sun shining on our house in the same way God's blessings shine on our lives. My life is not perfect. No one's live is perfect. But God has blessed me with a wonderful family, friends, and the ability to live in a place I love. As promised, here is my first installment in my Christmas All Year Long campaign. On the 25th of each month, I will be posting a Christmas card in hopes of inspiring all of us to get our cards done early this year. My thought is to do 10 cards each month, and by October we can have 100 cards ready to go. If you don't send 100 cards, do 5 each month and you will have 50 by October. Then when the holidays are in full swing, this will be one less thing you have to think about. I hope you will join me. My first card is a card I made for this last Christmas. It uses a technique called glitter masking from Technique Junkies. This technique is so pretty. It just sparkles like crazy. Basically for this technique, you need to run a piece of card stock through a Xyron machine to make it all sticky. After you remove the plastic, take the card stock off the release paper (the white sheet) and set aside. Use the release paper with a Big Shot die cut to create a mask for your project. Cut as many masks as you would like. You will then place the release paper die cuts on your sticky card stock in whatever pattern you choose. Sprinkle glitter on the card. Then remove the masks and sprinkle a different color glitter over the card stock. You can see how the mask allows you to have two colors of glitter on your card as a background. I die cut another snowflake, ran it through the Xyron, and added glitter for dimension, and topped it off with a build a brad. For more detailed instructions on glitter masking, check out Technique Junkies. You will love the techniques they teach you, and tell Pat that Julie Glasgow sent you. If you decide to join me making early Christmas cards, please leave me a comment and leave a link to your blog post. If you don't have a blog, send me your picture and I will post it to this site. 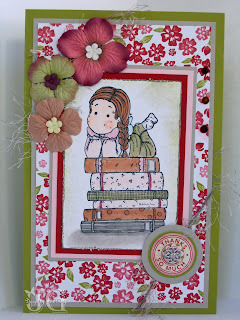 Pretty Pressings is offering some new Alota Stamps for blog candy. 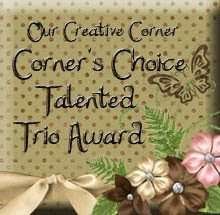 This is one of my favorite sites, so go check out her lovely cards and enter for some blog candy. 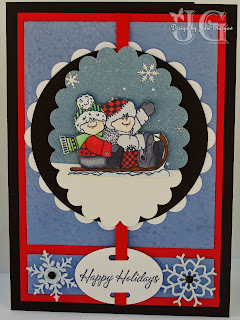 For this card, I used the colors Red Riding Hood, Basic Black, Kiwi Kiss, and Whisper White. The truck is colored with Kiwi Kiss and a Blender pen. The hearts are colored with my Red Riding Hood pad and a blender pen. 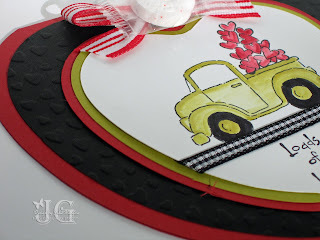 I used black grosgrain and layered black and white gingham to make the road for my truck. The candy is a Life Saver (in more ways than one as we don't have much candy around the house, and it happened to work perfectly). 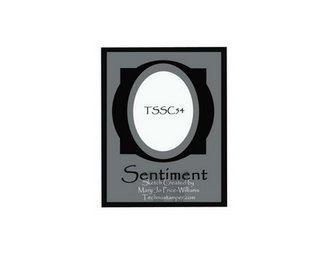 I created the card using the Creative Memories cutting system. I don't know if they are still available, but at one point, they had a couple heart templates. With the three different cutting blades, it allowed me to create the different size hearts. It is hard to see in the first picture, but I added a little something by sending the black heart through my Big Shot with a Fiskar's Texture plate that is hearts. To get a better impression, I spritzed the card stock with water before sending it through the Big Shot. The texture on the card stock is really nice with this method, and I suspect my stash of texture plates is going to see more action now. Check in on Sunday (or Monday) as I plan to post the first of my year long Christmas cards. Let's get a jump on the coming year and start working on those Christmas cards early. I will be posting Christmas card samples on the 25th of each month. Hopefully this year, we can be done with our cards before Thanksgiving! I thought I would change pace a bit and post a card I made last fall. This was made when I was just learning water coloring techniques. The pot is not the best, but helps me to remember how far I am coming along. 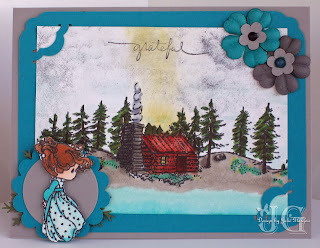 The stamp is from Stampin' Up!, "Serene Spring" and is now retired. I used my stamp pads and an Aqua Painter for the coloring. I used a stamp from "Priceless" for the swirls. The colors are Ballet Blue, Black, Yoyo Yellow, and Pixie Pink. I used blue taffeta ribbon and unraveled it to give that frayed look. I finished it off with some dots on the mat and around the swirls. Check back tomorrow for the Blogger's Challenge post. This week, the challenge is to use black, red, Kiwi Kiss and white or ivory which is an interesting combination for me. I created this card for a friend at work with an upcoming birthday. I was thinking "simple, easy to mail," but I got carried away. First it was the flowers, then the butterfly. Okay, now I need to add some beads to the butterfly. Oh, and decorate the inside of the card. So, now it is not so easy to mail, but I love it anyway. 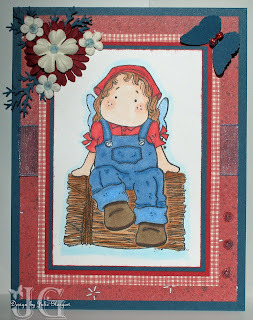 The stamps are Magnolia Farmer Tilda and Hay Bail colored with Copics. The solid paper is Stampin' Up! Not Quite Navy and Red Riding Hood (I just love this red). The background papers are more of my stash, so I have no idea who the manufacturer is (you will hear that a lot as I have a big stash). The flowers are Prima's. I added Crystal Effects to the center of the flowers, but did not like them clear, so I added a little color on top with my Copics. The butterfly is Martha Stewart with a couple beads added for interest. I also added a few drops of Crystal Effects down the right side of the card to imitate Dew Drops. I decided to decorate the inside of my card. I am getting a little better at remembering this added step that increases the appeal of the card so much. I covered the inside with designer paper with a little organza ribbon wrapped around. 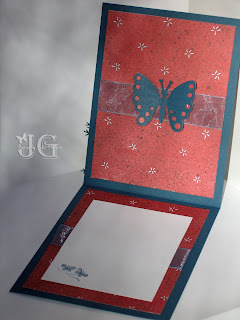 On the bottom left corner, I used my Not Quite Navy to color just the butterflies on a Tagger's Dozen (Stampin' Up!) stamp to continue the butterfly theme. 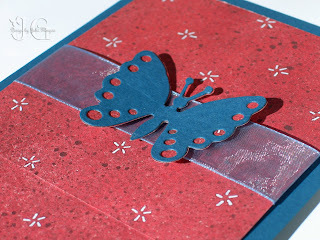 The top has an added Spellbinders butterfly to complete the butterfly theme. Now I just have to get to the post office to mail it before her birthday. This is another installment for my mom's owl calendar. This was for April and highlights a picture of my daughter's skating program last April. 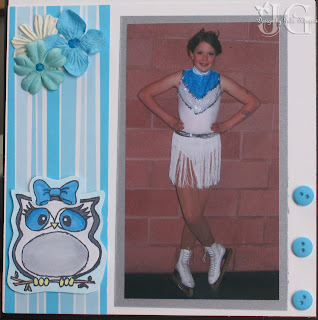 The owl stamp is from Sweet N Sassy Stamps. I colored her with Copics and added a bow. The paper is another one of those I have had for years and don't know the manufacturer. The flowers are Prima's. I added some buttons to finish it off (I believe the buttons are from Stampin' Up!). The page is very simple, but I just love those colors. I just wish I could have found some fringe to add to the page to highlight the skirt. Blogger's Challenge #82 is titled same but different. You can keep some elements the same, but need to change some things (i.e. the stamp set) I opted to use the same layout, but changed everything else. This first card is a thank you card. I used Tilda from the Winter Collection. I used a mask to stamp her on top of the books. I love the way this turned out. I used Copics to color the image. I am learning shading on the I Like Markers blog, so there is some shading on this image. 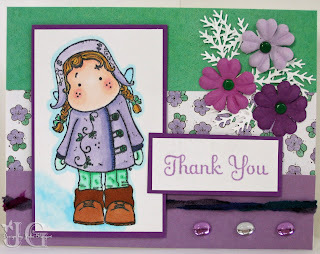 For the sentiment, I used Riveting (retired) from Stampin' Up! I used lots of layers to help it stand out. I used Prima flowers and Crystal Effects dyed with reinker down the side. 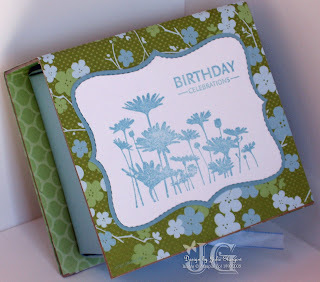 The cardstock and paper is from Stampin' Up! (Bella DSP, Kiwi Kiss, Pink Pirhouette, Red Riding Hood). I should note that the other thing I changed was the size of the card. This card is 8-1/2 x 5.5. For this second image, I opted to use the same layout, and changed everything else. I actually colored this image a while back when I first received it, but never got the elements together to create the card. I decided to use this challenge to complete it. This is bad, but I don't remmber for sure what medium I used for coloring. I believe I had just received my first Copics, and this was an experimental project. However, I could be wrong. Again, I used Primas for the flowers. I used some baubles I had around for years for the "drops" down the side. This is the standard card size (4-1/4 x 5-1/2) with the fold at the top instead of down the side. I hope you have a great weekend. See you Monday! I have posted this previously on Typepad, but wanted it on this site as well. 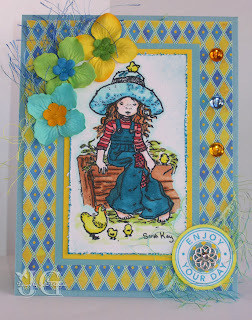 This card was created using the stamp set Anna Mae from a brand new company called Our Craft Lounge. 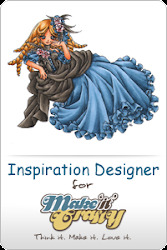 I stamped the image on designer series paper and cut the dress out and mounted it on the stamped image. I used an older Stampin' Up! 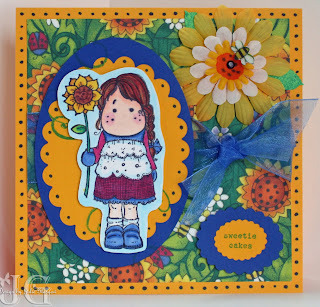 Simply Scrappin' pack for the paper and embellishments. Our Craft Lounge has some incredibly cute stamps. Go check them out. I made this card for my DH for Valentine's Day. 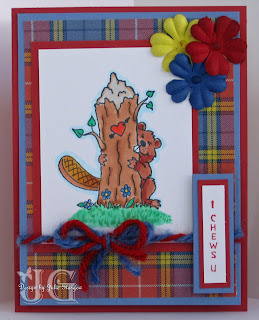 The image is from Our Craft Lounge, and is from the set "Bubs the Beaver." Is he not the cutest?! The cardstock is Stampin' Up! Red Riding Hood and Brocade Blue. The paper is some I have had for years (I am trying to use some of my old stock) from Paper Pizazz, "The Great Outdoors." I like this paper because of the masculine feel. I even added some flowers, and it is still not girly. I colored Bubs with Copics. Go check out Our Craft Lounge. They are just starting out, so there are not a ton of sets yet, but the ones they have are adorable. 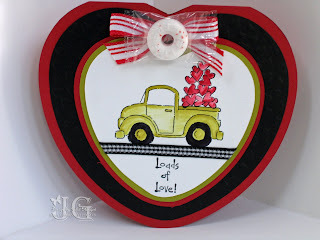 Three Clovers Designs is offering some really great blog candy. Pop on over to get a taste of what Kerry has up for grabs. While you are there, check out her great artwork! With all the snow we have received so far this year, I thought this was an appropriate post for the day. I created this page for March for my mom's 2009 Owl Calendar. I had fun manipulating the wing to hold the ski. The owl comes from Sweet & Sassy Stamps. The ski is Jolie's. The punch is Martha Stewart, and the flowers are Prima. Hope you have a wonderful day. See you tomorrow. This is my submission for the Blogger's Challenge #81. The challenge is to use any designer series paper from any company. I must admit, I feel like I am cheating because I have really gotten into using designer paper in most of my cards lately. So go ahead and check out some of my other projects. You may see designer papers in those as well. 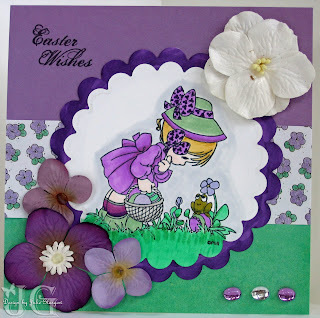 I created this card using some new Magnolia stamps I received. I have had the heart doilie for as long as I can remember and am thrilled to have the chance to use it over the designer paper. I have actually had the paper for a long time, and cannot tell you who makes the paper. 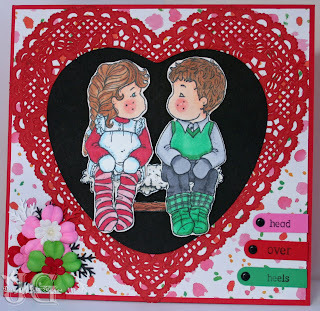 I used Copics to color the images, Prima's for the flowers, and the Word Window punch for Head Over Heels. Time to start thinking about those valentines. It will be here before you know it. 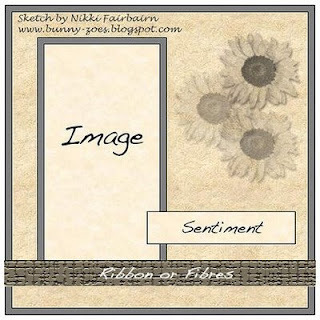 I created this card for Roses on Paper Challenge #3. The challenge is to incorporate White, Evergreen and Grape into your project. 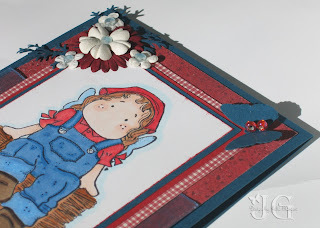 I decided to incoporate another challenge for A Spoonful of Sugar Challenge 33 into this card. The challenge for A Spoonful of Sugar is a sketch challenge. I have included the sketch below. Now the funny thing about the Roses on Paper challenge is that I did not read the challenge thoroughly enough. Part of the challenge is to use a Magnolia, Alota, Whiff of Joy, Sarah Kay, or Rachelle Anne Miller stamp. Oops! I was really wanting to play with an old stamp I have had laying around from Precious Moments, and finished the card before I realized the stamp did not meet the criteria. So, though I cannot use this card for the challenge, I thought it was worth sharing anyway. As it happened, it was an additional inspiration for the card above. Hope you enjoy. 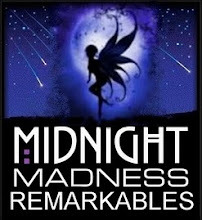 Check out this website for some great blog candy. While checking out the blog candy, take a look at some of Lim's creations. She is an awesome stamping artist! After getting my stamp room all cleaned up, I had the chance to finish a card I started a couple weeks ago. I have had the background paper for several years. I found it at a local scrapbook store. Sorry I cannot tell you who made this paper. I just love it with Tilda With Sunflower. Tilda is colored with Copics. For the bee on the flower, I cut a bee out of the designer paper, applied Crystal Effects, and mounted it on the flower with a dimenstional. I took the extra step of coloring the top flower and adding dots to make it match the paper. I plan to spend more time in my clean craft room this week coloring more Tilda's, so check back soon for more samples. I created this card when first trying my hand at adding dots to my projects. I sort of fell in love with the look. I also really like to layer, and layer, and layer. Stamps are from Stampin' Up! I finally had the chance to clean my craft room after the Christmas chaos. I can actually work in there again. I am looking forward to the opportunity to mess it all up again. I am starting off the new year by changing my blog from Typepad to Blogger. I hope to have the transition complete in the next few weeks. I really like the qualities that Blogger offers without the expense. If you would like to view some of the older posts, my typepad account will be active until at least the end of January. You can visit that blog here. Here is another page I did for my mom's Owl Calendar. 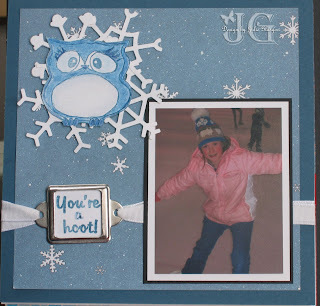 The owl is from Sweet & Sassy Stamps. The picture was taken last February when my daughter first started ice skating. Now she is skating nearly every day and will be competing in February. It is hard to believe.